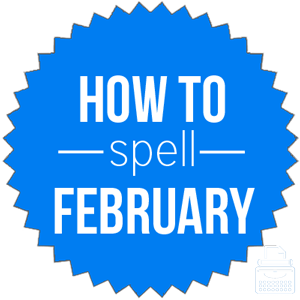 Spelling of February: February is spelled F-e-b-r-u-a-r-y. The “f” should always be capitalized because it is the name of a month. Definition of February: February is the second month in the Julian and Gregorian calendars; it is the month immediately after January, which is the first month of the year. In some countries, the holiday Valentine’s Day is celebrated on February 14th. February is the shortest month of the year, with less than 30 days. In common years, the month has 28 days, but in leap years the month has 29 days. Leap years occur every four years. Pronunciation of February: February is usually pronounced feb-you-airy, though it is properly pronounced fe-brew-airy. What does February mean? The word February is a proper noun. This means it should always be capitalized, whether or not it begins a sentence. In Canada, February is one of the coldest months of the year, whereas in countries in the Southern Hemisphere it is one of the hottest. We are going on a family skiing trip to Colorado next February and I can barely wait. The plural of February is Februaries and Februarys, though the plural form is very rarely used. Facts About February: Did You Know? March was originally the first month of the year in the ancient Roman calendar, making February the last. During the last weeks of the year, people made up for their wrongdoings to the gods by performing purification rituals. Such rituals were referred to as februa in Latin, and this is how the month of February received its name. The word February came into use in the English language before the 12th century, according to Merriam-Webster’s. The word February comes from the Middle English word Februarie from the Old English word Februarius. Ultimately, this word is of Latin origin, from the word Februa, which is the plural form meaning feast of purification. There are no synonyms for the word February because it is the name of a specific month. The word February is a proper noun denoting the second month of the year in the Gregorian and Julian calendar. 2 Facts About February: Did You Know?